Our Brooklyn pain management clinic Pain Physicians NY offer unique approach to treatment of Iliotibial Band Syndrome as well as other knee pain cases. We are one of the first practices in New York to offer groundbreaking Stem Cell Therapy, Interstitial Laser Therapy among other advanced procedures. Our facility equipped with the most advanced, cutting edge equipment to deal with Iliotibial Band Syndrome. Our pain management doctor in Brooklyn leon Reyfman is among best in region. We were selected to be a part of the international medical team for the Rio Olympic Games. The Iliotibial Band Syndrome (ITBS) is one of the most common injuries among runners, due to overuse. The iliotibial band is located along the thighs in the outside part of the leg, from the pelvis area to the tibia, where it extends over the hip joint as well as the knee joint. The iliotibial band is an important stability structure found in the knee’s lateral part where the joints flex and extend. When the iliotibial band is not working properly, movement of the knee becomes painful. The pain can be severe to completely sideline a runner for weeks or longer. Inflammation of the iliotibial band mostly manifests itself when the knee is moved or flexed back and front passing the femoral epicondyle. Iliotibial band syndrome is an overuse injury, which causes pain on the outside part of the knee especially during running when the heel strikes the ground. 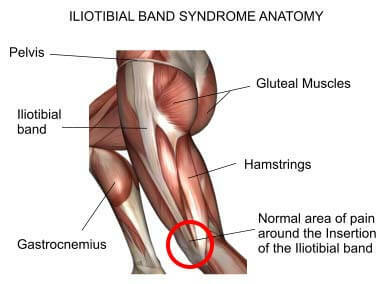 The swelling and the pain on the outside part of the knee is the most notable symptom of the iliotibial band syndrome. This is the reason that many runners first think that they have a knee injury instead of ITBS. The convenient and efficient way to know that you have iliotibial band syndrome is by bending your knee at a 45- degree angle. If you experience pain on the outside of the knee, then you have IT band problem. Use of X-ray to check for the injury usually gives negative results, but the use of MRI is the most convenient method since MRI exposes partial thickening of the IT band which would have resulted from inflammation. The primary cause of the IT Band Syndrome involves in activities that continually force the leg to move inward. This could include overstraining you in the workouts, running towards the same direction for long, running on steep grounds, wearing worn out shoes, or even running too many miles. As different as other characteristics of overuse injuries, IT Band affects both seasoned runners and beginners the same way. It does matter if one is well trained and used to running or not. The iliotibial band is structured in a manner that it becomes slender as it nears the knee, and rubbing/ friction can occur between the band and the bone, which causes inflammation. Make sure that your shoes are not worn out along the outside part of the sole. If they are, replace them. When you realize that you have ITB pain, the best way to get rid of it for good is to rest and avoid running. A failure to do so could lead to a severe and chronic knee pain due to a chronic iliotibial band syndrome. In the mean time, you could be involved in activities such as; swimming, pool running, cycling or rowing. If the pain persists after several weeks, it is advised to seek help from a sports-medicine professional.